The International Baccalaureate Middle Years Program provides a framework for education that I very passionate about. Without a fixed curriculum it provides the opportunity for teachers to development learning which is relevant to our students and overlaid with conceptual connections and global contexts. For student the criterion based assessment means that they can clearly identify what is required of them to achieve and further improve. This learning journey is also inquiry based which increases student motivation and deepens their understanding. As a workshop leader I often get the chance to share this passion. The rest of this page just covers some of the areas I am presently heavily involved with at school. 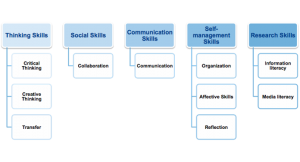 The approaches to learning categories and clusters have been explicitly identified by the MYP as the skills which our students will need for the future, and are shown in the diagram below. 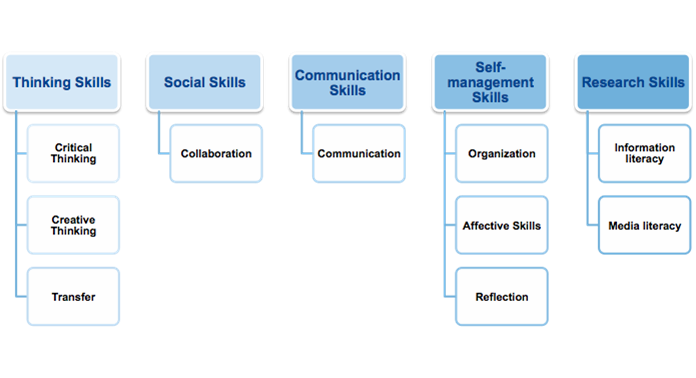 Across all subjects these skills become a prerequisite for success and are identified, discussed and developed. Learn – Within this section lessons have been created to help you develop ATL skills that will be completed during home room lessons. Support – Within this section support has been identified to help all students use across all the subjects within the MYP. For instance, sections include RESEARCH and REFERENCING. Review – Within this section the ATL skills required in every cluster has been identified. This can be used as a check list to help review a students abilities. Context – Within this section the ATL skills required to complete the objectives of every subject have been identified. Extend – Within this section further skills which could help with a life of learning have been identified and links suggested. Awards – Within this section an explanation is provided of the annual NISC Approaches to Learning awards. The personal project is a culminating element of the MYP and requires students to complete a suitably challenging individual project where they are required to reach a pre-determined outcome and reflect on this process through a report. Success in the this task really requires students to utilise the ATL skills they have developed through their MYP experience.